Although I love to switch up my makeup daily, there are always those products that I find myself reaching for more often than the others. I love trying new things and experimenting, but I'd be lying if I said I didn't have my tried and true favourites! Without further ado, here are the products I can't live without. I thoroughly enjoy splurging on beauty products, but in all honesty, mascara is not usually something I splurge on. This is due to the fact that I always seem to go back to my Covergirl Lashblast (in the large orange tube) no matter how much I spent on a different tube. But then, Eyes to Kill came along and changed everything. This is an extremely volumizing mascara, but not so much that it makes your lashes clump together. I have average length lashes, so I am normally skipping over the lengthening mascaras and searching for the volumizing ones. I discovered this through MakeupByTiffanyD on YouTube, and since then I trust every one of her recommendations. If you are also a fan of the Covergirl Lashblast and are looking for that extra bump in the mascara department, you must give this a try! I received a sample of this from an order I made online from Sephora, and it sat in my makeup storage for months before I tried it. I remember reaching for it on a lazy day because I didn't want to waste my "good" makeup on a day where I didn't care what it looked like. Little did I know, I would end up LOVING this foundation the minute I applied it. When you screw off the top of the bottle, it opens up to an attached sponge applicator. I personally am not a fan of these, so I use the applicator to place the product on the back of my hand then apply it to my face with a Beauty Blender. This foundation is definitely full coverage, even though Clinique described it as "light". I love this for days where I know I'll be busy all day, because I know it won't budge or fade. Because of it's full coverage nature, you only need a small amount to complete your entire face. 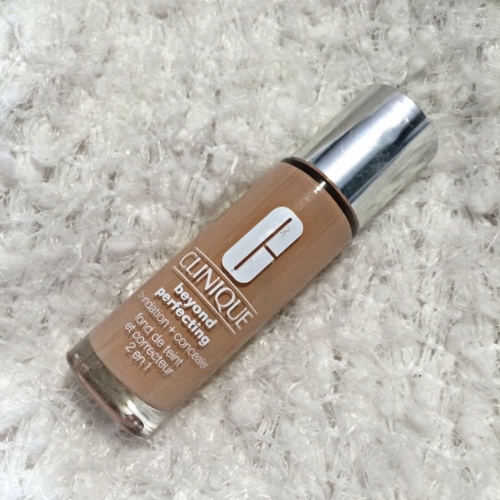 I especially love this foundation because of it's neutral undertone. I find it is difficult to find ones that don't pull too pink or yellow on me. This product most definitely surprised me, and is very underrated in my eyes! This is a smude-proof, waterproof pomade that serves as an all in one brow product. I used to just use a pencil to fill in the sparse areas of my brows, but I have since been converted to this. On my left eyebrow, I have two large scars that I always fill in. The pencil I used to use would fade after a few hours, defeating the purpose of trying to cover it in the first place. I would've been better off just leaving it! Now, my brow game is back. You can swim, sweat, sleep... it won't move. Another aspect I love about this is the shade. 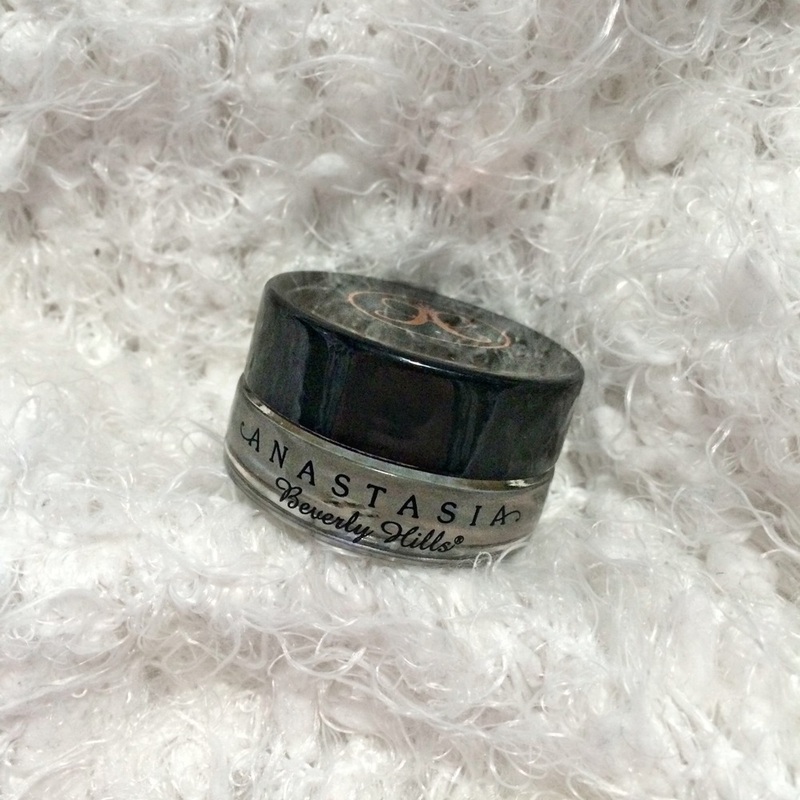 I love how all of Anastasia's brow products have an ash tone to them -- it makes the product look so much more natural than other warm toned brow products I have witnessed. 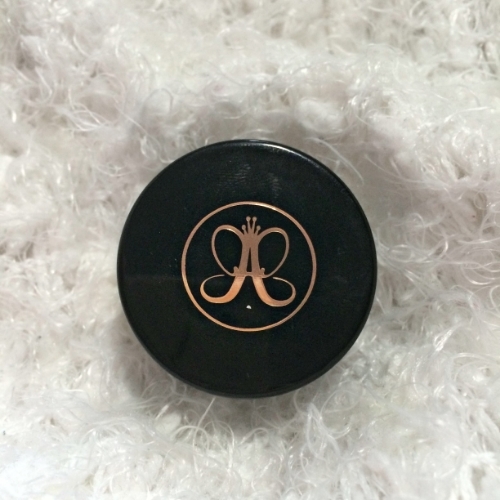 I use Anastasia's #12 brush to apply this, as it was recommended by the girls at Sephora. They have a large shade range, so there is sure to be one to match everyone! Before I go off an a tangent saying how amazing this product is, I will warn you, it was limited edition and isn't available in store or online at this moment.. I know, heartbreaking. BUT, MAC often repromotes products so there is still a strong possibility this this will come back. This cream based product is what I use if I want a very strong highlighted look under my eyes and on my cheekbones. If we're being completely honest, I call it my Kim Kardashian cream. Yep, ask my friends, this is true. This has a very bright white color with a pink undertone that can be sheered out for a more natural look, although I can be guilty of going a tad overboard in the highlighting department -- to each their own, I suppose! Ill apply this on top of my foundation with my ring finger, and set it with a translucent powder to ensure it won't slide around. I've had this for almost two years now, and I'm just starting to see the bottom of the pan. Just goes to show that a little goes a long way. 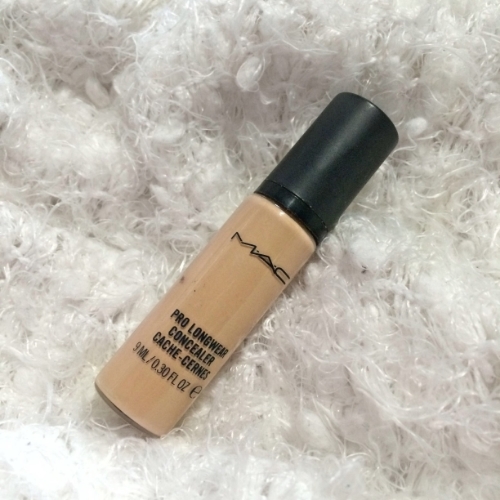 MAC describes this as a lightweight, fluid concealer that provides medium to full coverage with a comfortable, matte finish. On me, this concealer will last all day without budging, which is a quality I appreciate. I will sometimes use this on my under eye area, but will more often use it for blemishes. When I first bought a bottle, I was a little taken back by how small it was. I didn't think it would last very long but was proven wrong after having this bottle for over a year, and using it every day, too! I love how pigmented this is, and how you only need a very small amount to do the job. This lightweight, sheer blush adds a very warm, peachy glow to the skin and can also double up as a soft bronzer. A quality I appreciate about this is how it is extremely easy to blend, which is characteristic of their entire line of Mineralize products. This blush will pair well with any skin tone, as it isn't too dark or too light -- I love it in the Summer when I am a lot darker, and equally love it in the Winter when I have less colour to my skin. It's subtle shimmer gives a beautiful sheen without showing up too glittery. I wear this almost everyday, as it compliments any makeup look. This is a blush I recommend to anyone, and is a perfect starter for those of you who don't wear makeup very often. It seems like every makeup brand is coming out with their own version of a contour kit these days, but this one right here is the original pioneer. The OG, if you will. This palette comes with three shades -- three for highlighting, and three for contouring. The three highlighting shades are Vanilla, Banana, and Sand, and the contouring shades are Java, Fawn, and Havana. This formula is very blendable and will last the entire day. My favourite highlighting shade in the set is Banana. It is a soft yellow that adds brightness to the face, making you look more awake and refreshed. I also love setting my under-eye area with this. A perk about this palette is that the individual pans pop out, allowing you to just repurchase single shades -- this is perfect if you are someone who runs through certain ones faster than others. This palette is available to purchase at Sephora, but the refills must be purchased through Anastasia.com. I have tried Kat Von D's version, one by MAKEPFOREVER, and one by Australis; this one still takes the cake by a landslide. Creme de Rose is a lip balm that smoothes, re-plumps, and hydrates your lips for hours. I know it seems crazy to spend $33 on a lip balm, but I have truly never tried anything like it. It has an extremely luxurious feel and a light rose scent that lingers. As you can tell by the pictures above, this lip balm is very well-loved. It is scratched, cracked on the side, and still has sand in the small crevices on the lid from a trip to the beach. If that doesn't tell you how much I love it, then I don't know what will! I have tried Rosebud Salve from Sephora which is similar, but this has a thicker texture and leaves my lips feeling much more hydrated. This really is one of my favourite lip products of all time! Thank you all for taking the time to read today, and please let me know some of your all time favourite beauty products. I'm always up to try something new!